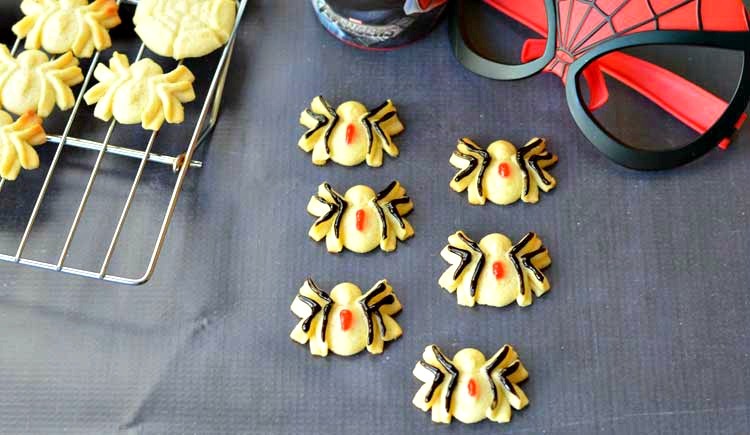 Spider cookies are with a sugar cookie dough, a cookie press, and simple gel frosting! Quick and easy for Halloween or a Marvel Superheroes birthday party. One of my favorite kitchen tools of all time is my OXO cookie press. Every fall I make pumpkin spice cookies with it using the Autumn disk set (they have a Springtime disc set and a Christmas disc set, too). But my kids love the spider cookies the most! And I'll admit, they turn out pretty cute and are super easy to make. My favorite kind of cookie! Using the cookie press does take a little trial and error. I found the spiders very easy to make. You just have to make a few first to determine how much to press down on the plunger to get the cookies to form properly. But once you get the hang of it, you can make dozens of spiders in not time at all. Check out my Pumpkin Spritz Cookie recipe for more tips and tricks on using the cookie press! The cookies don't spread at all so you can place the spiders close together on the baking sheets. They bake up fairly quickly since they are so small. Let the cookies cool on a cooling rack before frosting. The spider cookies look great just as they are, but a little color never hurts! I bought tubes of gel frosting in red and black to simply outline the raised portions of the spider cookies. You could use regular frosting and pipe it on, too. My kids oohed and ahhed over these and just loved them. We've made them several years now for school Halloween parties and they are big hit. Plus they are small so parents are happy to have less sugar in their kids! The Autumn disc set also has a spider web cookie shape, which goes along with the spiders. 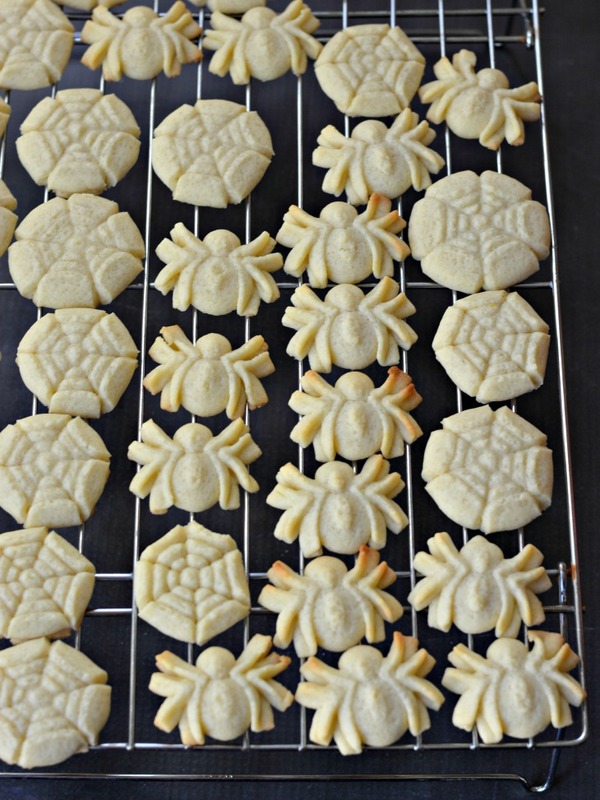 Check out these Spiderweb Sandwich Cookies from Home Cooking Memories, too! Cream together butter, sugar and salt in a large bowl. Beat until mix is light and fluffy, about 3-5 minutes. Add almond extract and egg and continue to beat until the egg is full incorporated, another 3 minutes. Add flour and mix until a dough forms and all flour has been incorporated. 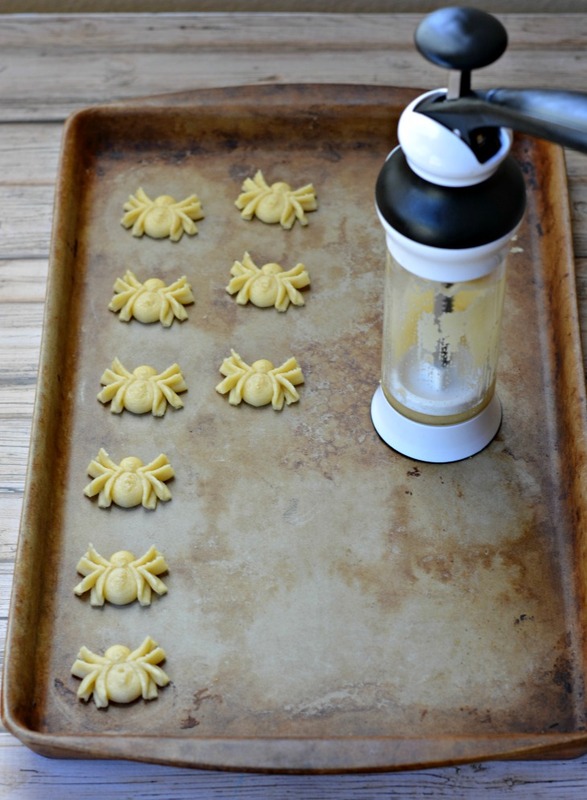 Fill a cookie press with dough and use a spider disk to make cookies according to press instructions. Bake for 8-10 minutes or until the edges of the cookies turn brown. 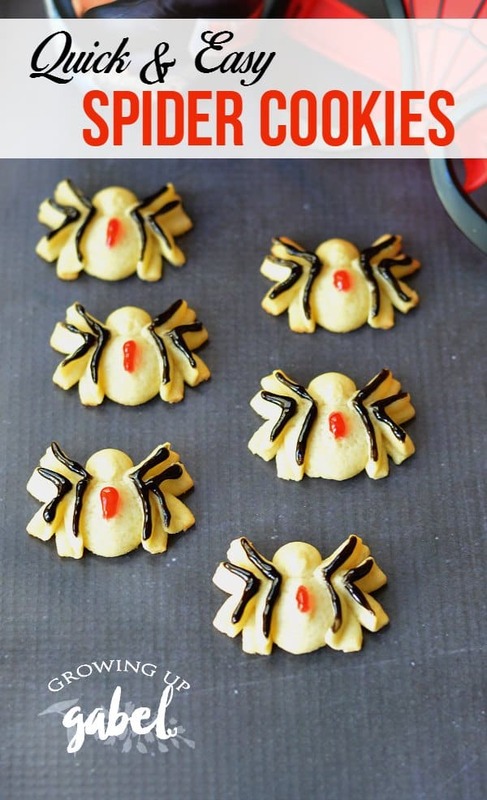 Your Spider Cookies are just adorable! Thanks so much for sharing with us at Full Plate Thursday. Have a great week and come back to see us real soon! These are so cute and look easy to make! Thanks for sharing with us at the Family Joy Link Party! I think I need that cookie press!! Thanks for sharing on the What’s for Dinner link up and don’t forget to leave a comment at the party – Next week’s features that also leave a comment get pinned and tweeted! I LOVE those cookie cutters. They are perfect for this time of year! Thank you for sharing on #HomeMattersParty! I love the cookies, they are adorable. They would be perfect for a Halloween party too. Thanks for sharing on Sunday’s Best linkup. I have always wanted a cookie press and for one reason or another I haven’t made the plunge to buy myself one. You have just made me add this to my list of buys this weekend. Your spider cookies are adorable! Thanks, Mary! I’m using mine year round now and I love it. Makes baking cookies quick and easy. Thank you so much for the feature, Jill! I had a cookie press years ago. Not sure where it is or even if I still have it. Your spiders look so cute. I need to look for my cookie press. I think I’ve owned a few cookie presses over the years! I finally appreciate it! 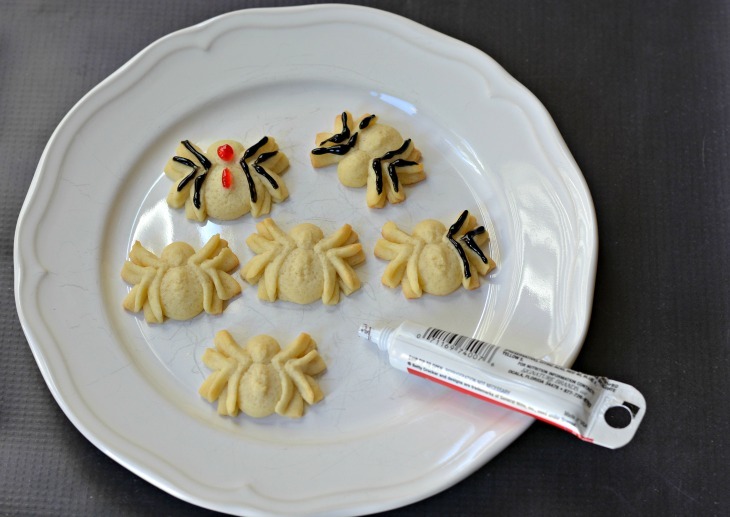 Very cute spider cookies and spider web. Thanks for sharing with Hearth and Soul blog hop. Pinning it. Your Spider Cookies are just adorable! Hope you are having a fantastic weekend and thanks so much for sharing this awesome post with Full Plate Thursday. You do! I’m having a ball with mine! 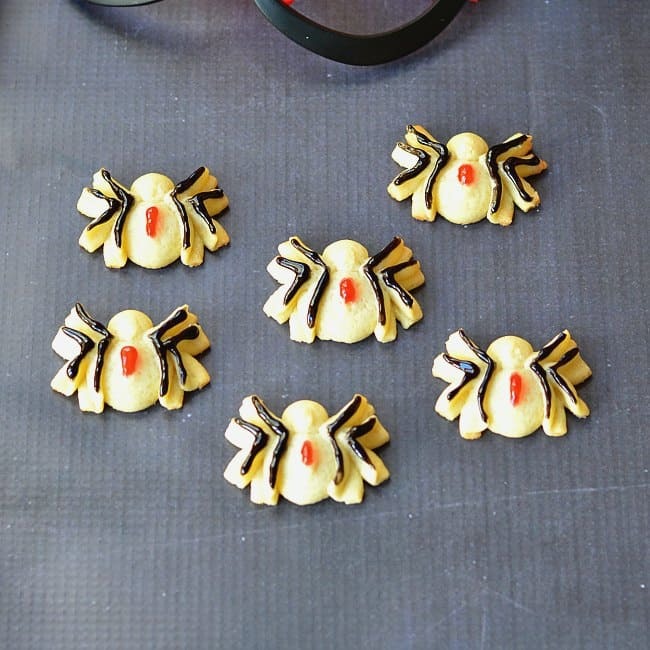 My kids think it’s the coolest thing yet and these spider cookies may be making an appearance at a Halloween party.